A shed or playhouse can add a stylish element to a yard. Is it time to build or install a new shed in your yard to serve as a garden work center or to provide additional storage for garage overflow? Or would you like to create something special for your kids…something they’ll never forget, like a playhouse? Maybe it’s time to explore the possibilities a little further. A shed or playhouse, after all, can be a wonderfully functional addition to your yard and, if well designed, can be an attractive visual design element. 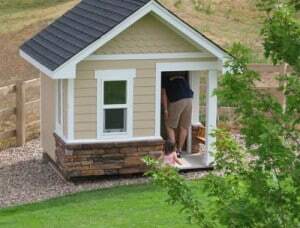 Sheds and playhouses are available pre-built, as ready-to-assemble kits, or as plans for do-it-yourself builders. In this section, you will find helpful information on choosing the right structure, designing it for your landscape, and building it. The basic structure and roofing of a shed or playhouse are very similar to those of a house. Of course, both sheds and playhouses are much simpler—for starters, they don’t require plumbing nor interior structural walls. In this section, you will learn about the basic anatomy of a shed or playhouse, common roof styles, and even how to remodel one. For more information, see Anatomy of an Outdoor Shed or Playhouse. There are sheds, and then there are sheds. The popular lean-to shed is within the grasp of a moderately skilled do-it-yourselfer. If your skills extend beyond that, you can consider building a classic gable shed or playhouse, which can also serve as a stylish outbuilding in your landscape. If your ambitions and DIY skills run deep, we even provide instructions on how to build a horse barn.